Dr. Lockhart examines one of his last patients, Linda Reynolds, on Thursday afternoon. 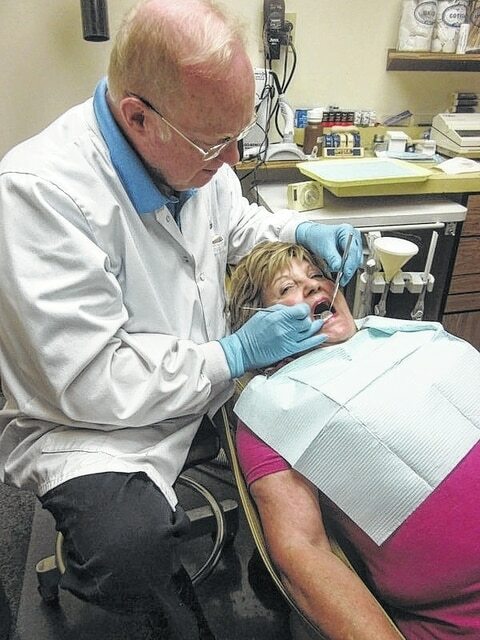 Dr. Lockhart, who has been practicing general dentistry in New Haven since 1982, saw his last patient Thursday afternoon. He and his wife/office manager Shirley Lockhart, will consider themselves “retired” when they leave the office Wednesday for the final time. When asked about their plans for the future, the couple said want to spend time with their four grandchildren. Many of Lockhart’s patients have been with the practice since it was established, including Linda Reynolds. Where will all his patients go now that he has retired? He and his wife are hoping many will stay with the practice when Dr. Kayanna Sayre, a recent graduate of the Ohio State University School of Dentistry, takes over the practice in mid- August. The couple said they are glad the office will be occupied and hope that Dr. Sayre finds as much community support when she begins her practice as they did 37 years ago.